Choosing the right HVAC system (heating, ventilation and air conditioning) may seem like a daunting task. But it doesn’t have to be. There are some simple factors that will help you decide what brand of central air conditioning system best suits your home. Some brands get better reviews than others in various categories, but the most important factor is installation. Proper installation by a reliable HVAC contractor employing certified technicians is crucial to the performance of any heating and cooling system. Whatever system you choose, you can be sure you’re in good hands with Berico. Berico is a certified dealer of Lennox, Armstrong Air, York, Goodman and Thermo Pride products. This guide to the best HVAC systems, along with your Berico technician, will help you choose the right system. An excellent HVAC system should rate well in the following categories: energy efficiency, comfort, reliability, noise level and life cycle. Choosing the right model will also depend on size and other factors that are unique to each home and homeowner. But this article will address each brand in general, taking all models into account. Lennox is a well-known name in heating and air conditioning. With a range of Energy Star products, consumers can easily choose an efficient model designed to use a minimal amount of energy to keep your home comfortable. From furnaces to air conditioners and more, Lennox heating and cooling systems rate well in consumer studies. Efficiency: Air conditioner efficiency is measured by the SEER rating (Seasonal Energy Efficiency Ratio). Lennox offers a range of models that have excellent SEER ratings, the highest being a 26. Anything above 16 is considered energy-efficient, and Lennox offers many models rated at 16 or above. Furnaces have AFUE (Annual Fuel Utilization Efficiency) ratings, measuring how much fuel they use each year to heat your home. The goal is to achieve an AFUE rating as close to 100% as possible. Lennox has furnaces that can reach a 98.7% AFUE. And the majority of its models have ratings of 80 to 90%. Comfort: This category is not as easy to measure. There’s no mathematical or scientific way to express how comfortable your home feels. Achieving optimal comfort comes down to choosing the right size system for your home, which your expert technician can help you with. Lennox offers air conditioners, furnaces and heat pumps in a variety of sizes, making it easy to find one that will fit your home. Reliability: Lennox HVAC systems are engineered to work efficiently with little maintenance. You can expect your home to stay warm in the winter and cool in the summer with little thought and effort on your part. Years of technological advances and design tweaks have made Lennox systems extremely reliable. Noise level: The best Lennox systems are virtually silent. You won’t even notice when your HVAC system turns on and off. Even the outdoor air conditioner unit, which tends to be the loudest part of your central air system, operates at as low as 62 decibels. Life expectancy: Lennox HVAC systems fall in the normal range for life expectancy. Air conditioners and heat pumps tend to last 10 to 12 years, while furnaces average 15 to 20. It is likely that with regular AC maintenance you will get more than the average number of years of good performance from your system. Environmental Impact: Lennox takes seriously the environmental impact of its products. Lennox complies with environmental laws and uses non-polluting technologies and recycled materials whenever possible. The use of solar panels in some products further supports Lennox’s commitment to environmental protection. Armstrong Air is a division of Lennox, meaning products share common design and manufacturing. You will see a lot of similarities between Armstrong and Lennox products. Efficiency: AFUE ratings range from 83% to 97% for Armstrong furnaces. Air conditioners by Armstrong hit a SEER of 20 at the highest, with most products achieving at least a 16, putting them just below Lennox in efficiency. Comfort: Efficiency has a bearing on how comfortable your home will feel. The more efficient your HVAC system, the more comfortable you will be. Armstrong air conditioners have variable capacity performance which allows for automatically adjustable cooling output. Armstrong products with high SEER and AFUE ratings will make your home feel warm and cozy in the winter and refreshingly cool in the summer. Reliability: As Armstrong is linked with Lennox, the products are equally reliable. You can expect to avoid the sorts of problems that occur with lower quality HVAC systems. Noise level: The Armstrong Pro Series is known for extremely quiet operation. Furnaces built with adjustable fan speeds allow for maximum efficiency and quieter operation. Life expectancy: You can expect to get 10 to 12 years out of your air conditioner or heat pump and 15 to 20 years out of your Armstrong furnace. Systems often exceed the average life expectancy when properly maintained. York is known for manufacturing both residential and light commercial HVAC products. York’s parent company, Johnson Controls, also manufactures replacement parts for HVAC systems. Efficiency: When it comes to furnaces, York boasts AFUE ratings as high as 98%. York air conditioners top out at 18 SEER, which is still very energy efficient. Comfort: York furnaces are designed with a self-adjusting burner that will make small changes as needed to provide the proper level of comfort. Air conditioners are designed with precise temperature control and advanced compressor technology to keep your home comfortably cool no matter how hot it is outside. Reliability: Any unit offered by York requires regular maintenance to prevent common home AC problems and to ensure top efficiency. This brand will run smoothly when cleaned and tuned up yearly. Noise Level: York air conditioners operate very quietly using fans and sound enclosure to reduce noise levels, as well as a composite base to reduce vibrations. Life Expectancy: The average life expectancy of 10 to 12 years for the AC unit or heat pump, and 15 to 20 for the furnace applies to York products as well. When it comes to oil furnaces, Thermo Pride is a reliable choice. Thermo Pride makes both gas and oil furnaces, but their oil furnaces are historically rated the best in the industry. 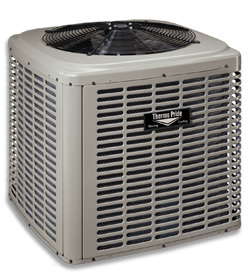 Air conditioners and heat pumps are among the other HVAC systems manufactured by Thermo Pride. Efficiency: Thermo Pride air conditioners achieve a top SEER of 16. While this is still considered quite efficient, some other brands are achieving much higher SEER ratings, meaning they use less energy to cool your home. Gas furnaces by Thermo Pride have AFUE ratings as high as 97%. Comfort: Thermo Pride oil furnaces achieve a higher temperature rise, meaning the air coming through the vents is warmer than what the average furnace creates, making your home feel warmer and more comfortable in cold weather. This is why some consumers prefer oil to gas heat. Reliability: As with any HVAC system, regular maintenance is the key to reliability. Having a professional yearly tune-up levels the playing field between different manufacturers when it comes to reliability. Noise Level: All moving parts are designed for quiet operation and specially mounted to reduce noise output. Life Expectancy: Average life span can be expected from Thermo Pride products with yearly maintenance. Goodman makes both residential and commercial heating and cooling products, and is known for being an affordable option. Efficiency: Goodman furnaces achieve AFUE ratings of 80% to 95%. Air conditioners top out at a SEER rating of 18. Comfort: Goodman heating and air conditioning products are known for being affordable as well as reliable. You can expect to achieve comparable comfort from a system that is most likely priced lower than the competition. Reliability: As with all other systems, Goodman HVAC equipment operates reliably with routine maintenance. Yearly tune-ups are recommended for all central air systems to run smoothly and efficiently without common home AC problems. Noise Level: The top line AC units operate at between 71 and 74 decibels, which is about average. Life Expectancy: The average life cycle that applies to all of the above brands holds true for Goodman. AC units and heat pumps are good for 10 to 12 years, and furnaces for 15 to 20 years. Keep up regular maintenance and you may extend the life of your system well past the average. Environmental Impact: Goodman has made the switch from the older CFC-based coolants to the new, more environmentally friendly R-410A refrigerant. The most important factor between major manufacturers of heating and cooling systems boils down to efficiency. For the most part the life expectancy and reliability are pretty much the same across all brands mentioned as long as the system is properly maintained throughout its lifetime. Some manufacturers focus more on environmental impact than others, but all are bound by the same environmental regulations and laws. There may be slight differences in noise levels, but that applies more to individual models, rather than the brand as a whole. When it comes to efficiency in air conditioners, Lennox and Armstrong Air have the highest SEER ratings. Goodman and York closely follow, and Thermo Pride still offers efficient models at a 16 SEER. Efficiency is important because this factor directly affects your energy bill. In most cases, the more efficient the system is, the more expensive it will be up front. But the more efficient your air conditioner, the lower your monthly energy bill will be, which will add up to tremendous savings in the long run. Where heating systems are concerned, the manufacturers compared were all pretty equal in AFUE percentages. The real difference shows in the fuel type used – gas versus oil versus propane. The cost of heating your home and the type of furnace you should choose comes down to fuel costs and availability in your area. Natural gas is not available for all residences, in which case propane and oil are comparable alternatives. You may find that these alternative fuel types are more cost effective than gas, even if it is available to you. Your trusted HVAC specialist, Berico, is more than happy to help you to determine what fuel option is best for you. The ultimate difference between a good HVAC system and an excellent HVAC system is the installation. An air conditioner or furnace can only work efficiently if is properly installed. The system itself and the accompanying ductwork should be installed by a professional HVAC company with well-trained technicians. Some brands only allow certain companies to install their products. The company and the technicians must be certified by the manufacturer to install the equipment. This ensures that every aspect of the installation is done correctly. Another important part your HVAC contractor plays in the process is the sizing of the system. The comfort of your home depends on having the right size system installed. The sizing is based on the square footage and the layout of your home. The total HVAC installation cost will be determined from a combination of the model purchased and the size of your home. Berico technicians are certified to install Lennox, Armstrong Air, York, Goodman and Thermo Pride systems. You can trust the professionals at Berico to recommend the best HVAC system for your home and install it with the precision and accuracy that will allow you to get the highest efficiency and the longest life out of your equipment. Contact Berico at (336) 273-8663 for a free estimate.